Well would you look at this prickly little fellow! 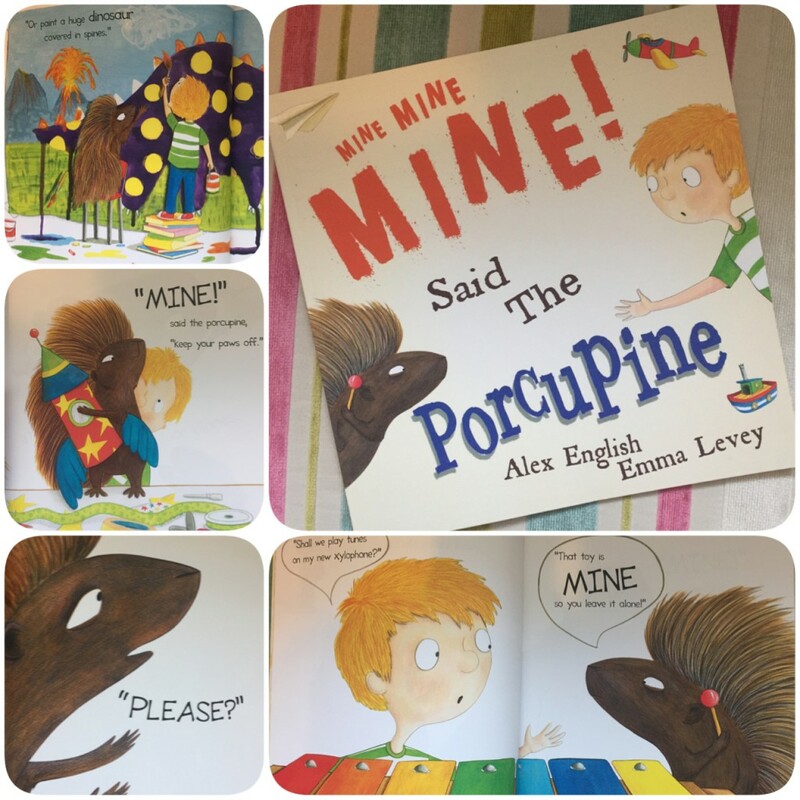 A porcupine in a picture book? I’ve not seen that before, but this is pretty much the ideal book for a grumpy little animal to reside in. This is Mine Mine Mine! Said the Porcupine. Written by Alex English, illustrated by Emma Levey and published by Maverick Arts Publishing. So why would this be the ideal book for a prickly character? Because it’s a book about sharing, about friendship. When a porcupine turns up at Alfie’s house, he’s keen to play with this unusual animal. He offers up numerous fun activities and toys, but the unfriendly porcupine wants them all to himself, and refuses to share with Alfie. “MINE!” he declares as he snatches the toys from the friendly but increasingly disheartened little boy. Poor Alfie soon gets tired of this unfriendly behaviour and realises he can have as much fun playing by himself, in his own imaginary land. The prickly porcupine soon learns that toys aren’t as much fun without a friend to share them with. At the library where I work, we are often asked for books on teaching children to share. There are some around, but I can say wholeheartedly, that this one is my new favourites! There are a couple of reasons why it stands out. Firstly, it’s beautifully simple and clear. The writing by Alex English reads so wonderfully. It’s in rhyme and flows like a real classic picture book which almost anyone can confidently read out loud. Full of expression and fun, but with few words so the important message being explained is not lost on young children. I read this out loud a few times and it sounds wonderful! I can’t wait to do so at a storytime soon. The basis of this book is about encouraging children to share, to understand that friendship and having fun together is a much more enriching experience than having all the toys in the world and playing alone. It’s a simple yet crucial life message, fantastically well explained. Emma Levey’s illustrations really mustn’t go unnoticed here. Again, like the wording, there isn’t a lot of detail on the pages. It’s not to say the illustrations aren’t complex, but the background is generally a plain white page so that the focus of the story are the two budding friends and the toys they are trying (or not in porcupine’s case) to share. The illustrations which are there, are bright and colourful and FULL of expression and include little details which draw you in, but again are all there to aid the explanation of the message. It’s perfectly done. I really do love this style of illustration, and it is the perfect vehicle for a story like this one. So, hand in hand, the writing and illustrations in Mine Mine Mine! 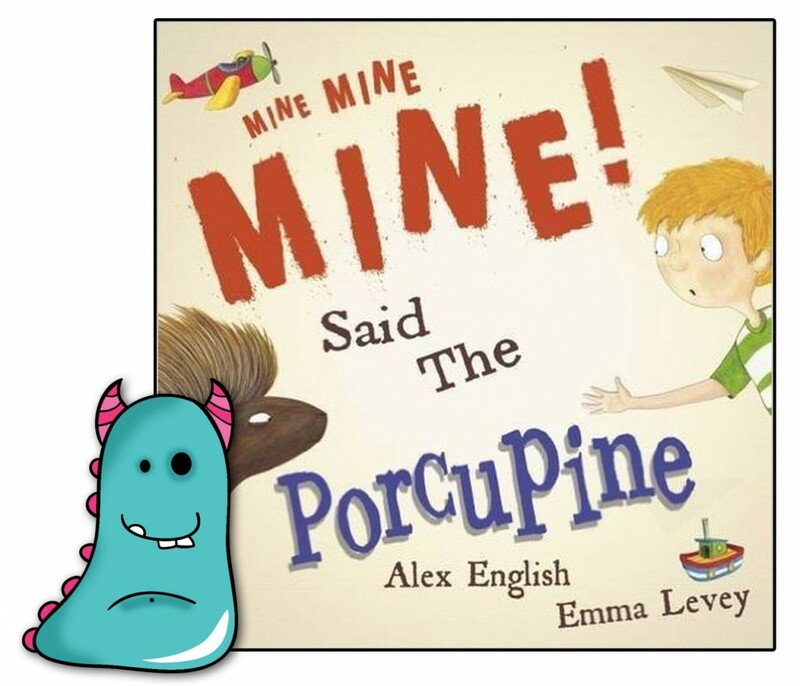 Said the Porcupine work together to reinforce the importance of friendship and imagination in playtime to children in a fun, colourful and characterful way. Lovely, really lovely. It made me smile. Simple as that. And even if a child plays wonderfully well, doesn’t need to learn to share, is the friendliest chap in school, it’s still a bundle of giggles for anyone to listen to at bedtime or storytime. In honesty, the more books we have that show children how vital friendships are the better. Mine Mine Mine! Said the Porcupine is now available from all good book shops and libraries. Thank you for reading (and hopefully sharing) this Book Monsters review.